Last edited by zenira on Sun Apr 02, 2017 8:30 pm, edited 2 times in total. Works for me as well. I've attached a writer document with it. 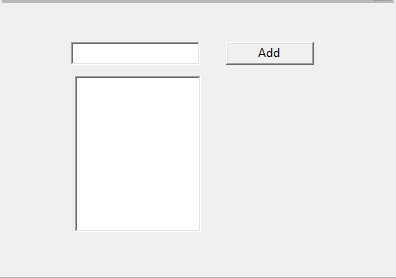 A combo box is a combo box becase it combines a text box with a list box. 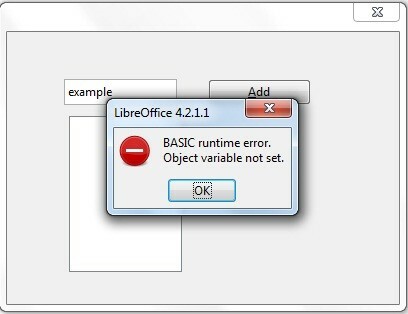 when i click Add button, i get this message "BASIC runtime error.Object variable not set"
You can not do this without minimal programming skills. You've got to understand the error messages and the code. It also won't work because in your AddButton function you create a new dialog oDlg which you don't show. at the top of your modules so every variable has to be declared. Thank you guys for your help. I did everything, I spend hours about this issue . I changed my code. Simply I want to get textbox's text but I get "Object variable not set". I realize that the code works on calc document but it does not work writer document. Same code. You need to read up on "Scope and Life Span of Variables" in the OpenOffice BASIC Guide. Your last code works fine here in OpenOffice if you change it to textbox.Model.Text. RoryOF wrote: You need to read up on "Scope and Life Span of Variables" in the OpenOffice BASIC Guide. JeJe wrote: Your last code works fine here in OpenOffice if you change it to textbox.Model.Text. it works in calc document but does not work in writer document. Last edited by UnklDonald418 on Sat Apr 01, 2017 11:05 pm, edited 1 time in total. Try changing the names of all your variables and controls and subs. That isn't going to work because the Sub Main doesn't run any of the code following the oDlg.execute line until the dialog is closed. JeJe wrote: Try changing the names of all your variables and controls and subs. Why do you keep changing it to TextBox.Model.getText? JeJe wrote: Why do you keep changing it to TextBox.Model.getText? I added a couple of things. additem(textarea,0) inserts the new entry at the top of the list, additem(textarea, SaveBox.getItemCount) adds it to the bottom of the list. Also the last line clears the Text Box, ready for a new entry. 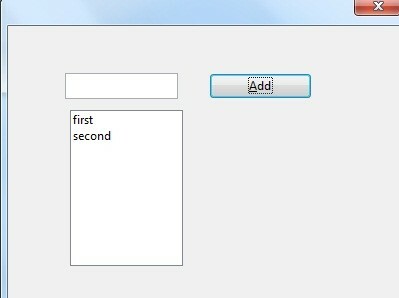 When I run the dialog and type something into the text box and press the Add button that string appears in the list box. Thank you guys, specially UnklDonald418,JeJe,RoryOF,Villeroy. thank you advices.